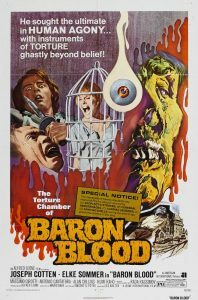 Baron Blood is one of my favourite Mario Bava films. As usual, Bava seems dismissive of things like story, character and acting, and concentrates on creating a memorable mise-en-scene, which makes a lot of the juxtaposition of the old and the contemporary: an ancient castle with a Coke machine, Elke Sommer in a miniskirt running through old fog-shrouded streets, etc. Immediately after Baron Blood, Bava filmed what I consider his masterpiece, Lisa and the Devil (also with Sommer) which was sacrificed by its producers to splice with new footage for an Exorcist ripoff called House of Exorcism. Baron Blood fared much better, suffering only from being rescored and cut by eight minutes. If you want to know where Dario Argento learned his tricks, look at Bava.